I had all sorts of aspirations about this being a lovely and word-filled post, celebrating the beauty of the Spring farmer’s market. And then…I got sick. Nothing too serious, mind you. Just your standard issue scratchy throat/stuffy nose/achy body/stupid head cold. The most troubling side effect of this head cold? Truth be told, my brain just feels squashy. I don’t know how to describe it any better than that. Its like my synapses aren’t firing correctly and all the the things I’m thinking aren’t spilling out onto the page. Everything is sloshing about in my cloudy head. It isn’t pretty. So, then, rather than write a lovely and lengthy blog post, I’m going to give my squashy cold-infested brain a rest. I will, however, leave you with photos and recipes for not one – but two – perfect spring toasts. I made these for dinner last week, after a trip to the PSU Farmer’s Market. So, then, here is how I transformed a few lovely farmer’s market purchases into a simple and delicious dinner (aka Spring on a Plate). *Optional: feel free to stir any herbs you have on hand into the butter to make an herbed butter spread. I added in some chives and they worked nicely with the dish. Add a dash of salt & pepper to butter, stir until mixture is smooth & creamy. 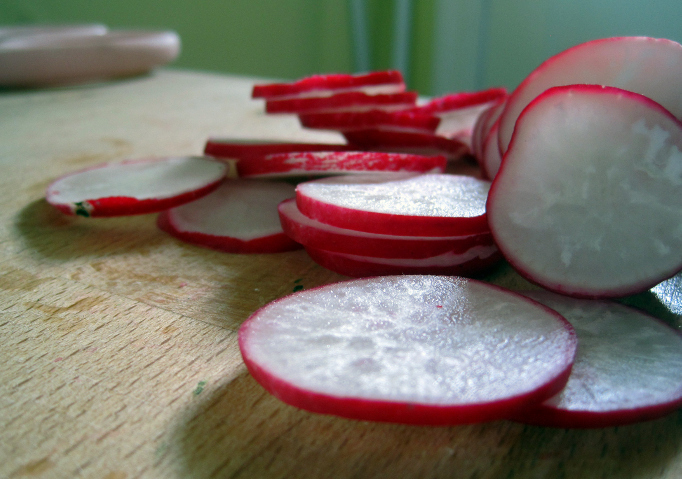 Wash radishes and slice thinly. Set aside. Toast bread slices in a skillet on the stovetop with a dash of oil or butter, until bread is golden brown (Note: can also use a toaster for this). Allow the bread to cool for a minute or two before spreading the butter mixture on it. Spread butter mixture atop of toasted bread slices. Top butter mixture with a thin layer of radish slices. Sprinkle with fresh mint, garnish with extra salt and pepper if you so desire. Serve immediately. In a small pan, heat a dash of olive oil. Add in sliced leeks, stir to coat in olive oil (add more if necessary). Slowly cook leeks over medium-low heat until caramelized (about 30 minutes). The leeks should be tender and starting to slightly brown. Once the leeks have caramelized, remove from heat. 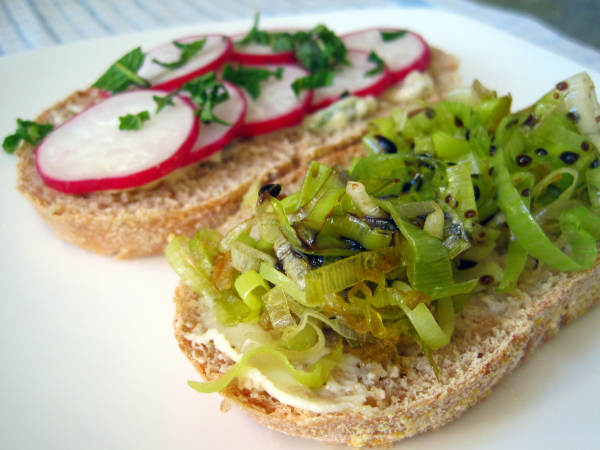 As with the radish toasts, toast a few slices of bread in a skillet (or toaster). Spread a thin layer of butter over each piece of toast. Top with a generous pile of caramelized leeks, a healthy drizzle of aged balsamic and freshly ground pepper. Serve immediately. ← Wordless Wednesday: Shades of Spring. I totally have all the ingredients on hand (right down to the bread dough!). Must try. I love cooking without giving a second thought to the grocery store. Love simple spring fare! Can imagine the flavors, so straight forward and pure. Lovely idea! Hope you are on the mend! Both tartines look fantastic, but I always gravitate towards the oniony stuff. The leeks look fantastic! Reducing balsamic vinegar is a great tip to ‘age’ it. Thanks! Gorgeous toasts! Radishes are one of the few veggies we actually have around here so I will for sure be trying these. Hope your squishy brain feels better soon! Ooh, this looks lovely ! I love love leeks and this is a great way to have them !